Rodney King won this round against cops unanimously. The 44-year old whose beating at the hands of white LAPD officers who were later acquitted sparked deadly race riots in Los Angeles nearly two decades ago was the unanimous winner in a celebrity boxing match outside of Philadelphia. King took on ex-cop Simon “The Renegade” Aouad, 31, at the Philadelphia Airport Ramada Inn in three rounds and drew a crowd of about 500 fans, according to the New York Post. 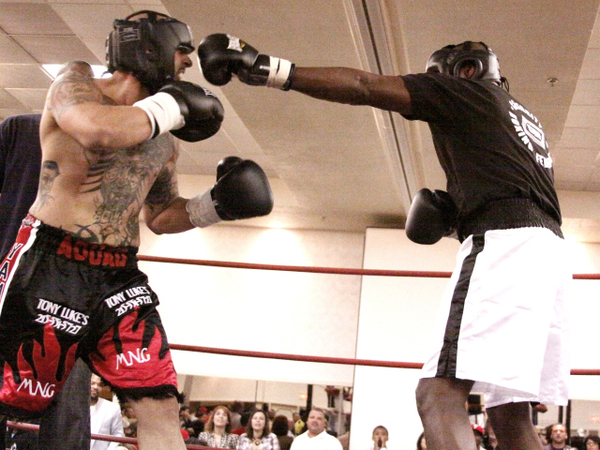 The 6-foot, 215-pound tattooed Aouad, who worked as an officer outside of Philly, came to the fight with a 36-0 record and 34 knock outs. The 6-foot-4, 250-pound King trained for the fight by sparring, hitting bags and jumping rope, according to the Post. The three-round match was sponsored by Celebrity Boxing.